You've always known you were a princess. And now it's time for everyone else to realize what you've been trying to tell them for years! 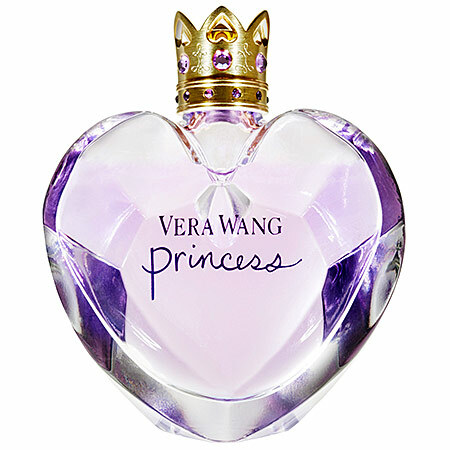 What better way to do that than by spritzing on the delectable Vera Wang Princess? The queen of fashion has made a foray into the beauty world with a bang, delighting the senses with a mix of fruity and floral elements just waiting to make you into the princess you've always believed yourself to be. Mandarin meringue! Golden apricot skin! Pink guava! Lady apple! Dark chocolate! Those are just some of the notes you'll find inside ... as well as vanilla, amber, water lily, Tahitian flower and wild tuberose. But what this beauty chick really digs is the bottle -- a vision of beauty in a prismatic jewel-cut crystal heart, containing a sparkling lavender-hued fragrance and topped off with an amethyst-encrusted gold crown. And best of all? The crown doubles as a cocktail ring. Now that's royalty. Vera Wang Princess retails for $45-$75 at sephora.com.